Today I am featuring an interview with distinguished poet John Foulcher, who was the Keesing Studio resident right after me. When were you the Keesing studio resident? And why did you decide to apply for the residency? I was resident in the Keesing studio in the latter part of 2010 and the January of 2011. I applied for the studio because I felt my writing was stagnating a little and I felt I needed some time and stimulus to give it a kick start. I couldn’t imagine a better place for this than Paris, which is my favourite city. I also didn’t think I had a hope of getting it; I was over the moon when I did. What did you work on while you were there, and did it change from your original conception as a result of the residency? This sounds terribly pretentious, but I wanted to write poems about the relationship between the physical and the spiritual while I was in Paris – a sort of dialogue between body and soul. Also, I’d been reading a lot about French history, particularly the revolutionary past of Paris. So many of our roots are there, and I wanted to see this up close. I remember standing in the Pere Lachaise cemetery at the wall when the last communards were lined up and shot in 1870. The bullet holes are still there. I remember finding Robespierre’s last residence on the rue St Honore, a very chic clothing shop now. There were many other such times. The concept didn’t change much but the way I explored it did. I realised when I got to Paris that I really didn’t know much. The final book of poetry, called The Sunset Assumption was very different to the one I thought I’d write. What were your first impressions of the Keesing studio and its neighbourhood, and how did that evolve over the course of your residency? I loved the studio and the neighbourhood from the moment I arrived. 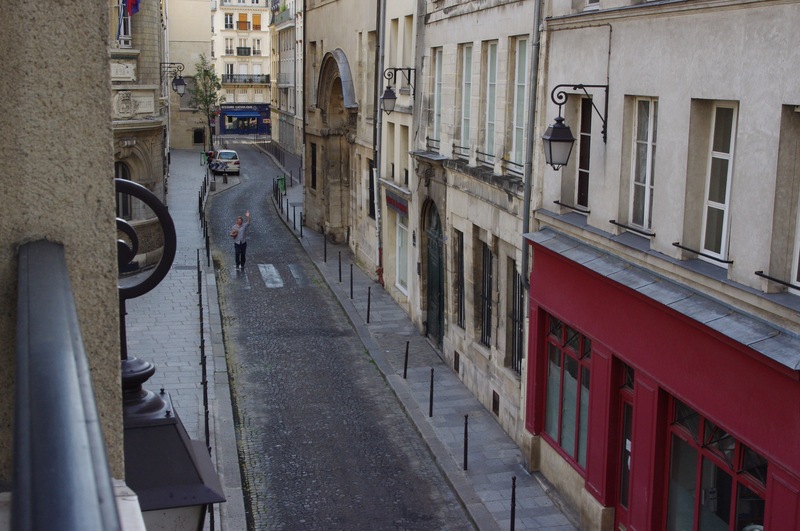 Yes, the studio is only small and very basic, but it’s in such a good spot and the rue Geoffroy L’Asnier is wonderful. As soon as we arrived, I went for a walk by myself – within five minutes I found myself on the Ile de la Cite standing in front of Notre Dame de Paris. In the coming months, that became our nightly walk – I had to keep reminding myself to be astonished! 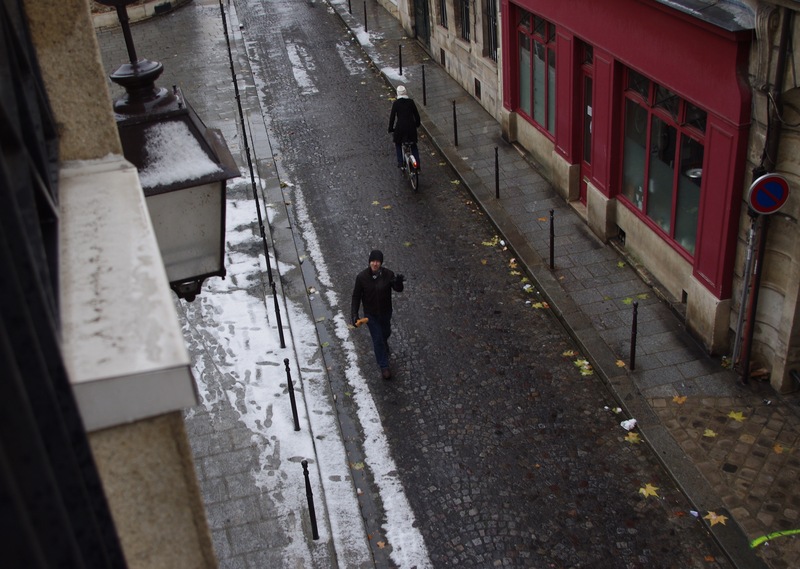 I loved the Ile St Louis, and the Marais is terrific. And there are three Metro stops which will take you just about anywhere in Paris. Through the course of the residency, I explored the area deeper and deeper. I found the best days weren’t the ones where you were going to the Louvre and so on, but the ones where you were just ‘hanging around’ buying groceries, having a coffee in a street café or wandering down to the Seine with a book. A close friend once said to me that, of all the cities he’d visited, Paris is the one which makes you feel most alive. I found that to be true. Your wife Jane came with you on the residency. Thinking of it in terms of both of you, what were your favourite things about living in Paris for six months–and your least favourite things? Strange as it may sound, I loved the churches of Paris most. 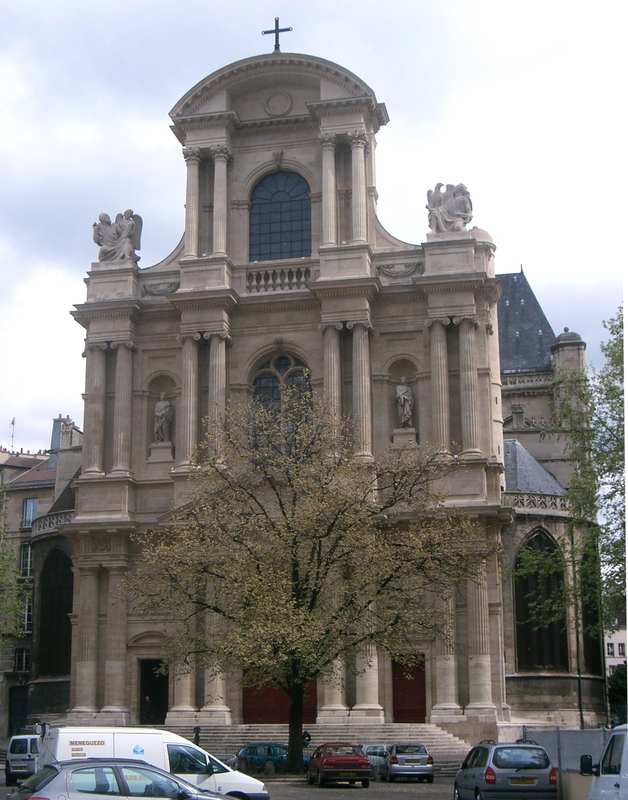 Not just Notre Dame, but others as well – St Severin in the 5th, for example, or St Eustache in the 3rd. No matter what one believes, Paris wouldn’t be the same without its churches. They take you back into history and beyond into another space. I hate it when people call barbaric practices ‘medieval’; ‘Go and spend some time in Notre Dame,’ I feel like saying, ‘or Chartres Cathedral – then tell me things were barbaric in medieval times.’ We’re too fond of caricaturing the past, of pretending our age is superior. As the residency went on, we found ourselves going to vespers at St Gervais-St Protais, just around the corner from the Cite, every night. There was a working community of nuns and monks there called the Fraternities of Jerusalem, most of them quite young, and their chanting and the almost physical silences there were among the most deeply moving experiences of my life. The last time I went there on a cold January evening, I left in tears. It’s left a gap in my life I haven’t been able to fill. I often say, since then, that I believe all church services should be conducted in a language the congregation doesn’t understand; words, in the end, just get in the way. Evening strolls by the Seine were also sublime, as is the Place des Vosges. My least favourite things were my own inadequacies – I have a very good French accent and I would practise interactions with shop-keepers and so on, but they talked so fast in return I found myself completely lost. I felt like such a fool. Even ordering a coffee was a traumatic experience. By the time the residency was coming to an end, though, Jane and I remarked that Parisians were starting to speak a lot slower. How considerate of them! The number of homeless people and refugees in the centre of Paris was also deeply unsettling. In his novel, The City & the City, British author China Mieville explores the notion of interlocking cities and the idea of perception. In that novel, the premise is that two cities are built on precisely the same spot but one chooses to ‘unsee’ the other. There are many cities in Paris, and we choose daily to see only one of them, the ‘prettiest’ one. What did you think of it as a writing/ideas environment? 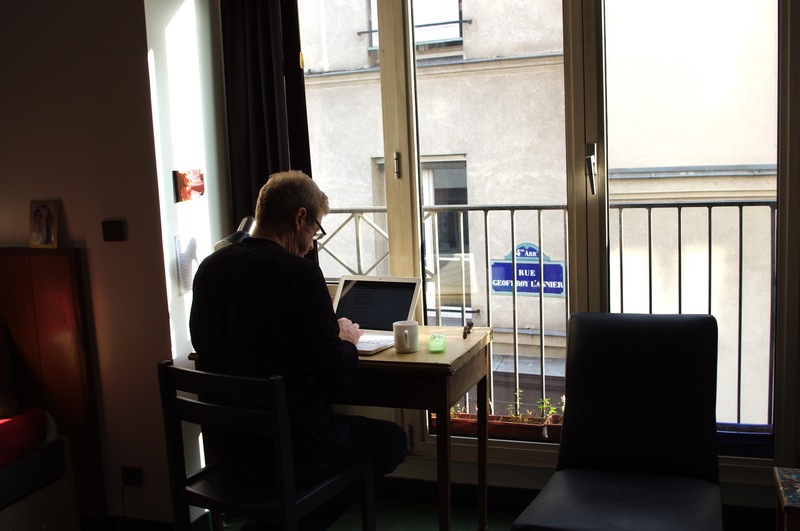 My publisher said to me on my return that if one can’t be inspired to write in Paris, one can’t be inspired anywhere. Every day poems would come tumbling in the window in Paris. It rejuvenated my writing at a time when I thought I was about to stop. It’s all sensory and intellectual overload. Tell us about some of your favourite places in Paris–sites, culture, food. Too many to mention. As I said before, I loved the churches, the Place des Vosges. There were other places – the Rodin Museum, the George Pompidou centre, the Albert Khan gardens in the 16th, the Luxembourg Gardens, which William Faulkner described as the most civilised natural space in the world. 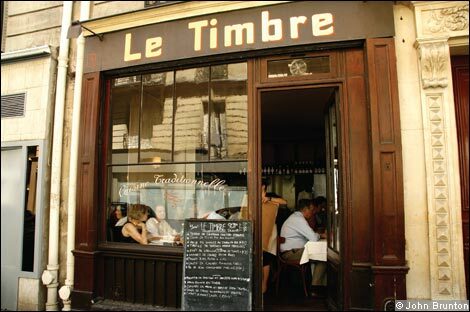 I loved a wonderful little restaurant we found in the 7th called Le Timbre. The markets were terrific as well, and the boulangeries. What experiences stand out for you in those six months in Paris? I think I’ve just about covered that. The only thing I’d say, finally, is that I thought my stay in Paris would be quite a solitary one, like a retreat. It wasn’t. I met so many people, particularly through the Cite – I met people at French lessons and in the laundromat. Not many of them were French, mind you, but I met artists and writers from all over the world. I made good friends with a Swiss artist, Judit Villiger, who did the illustrations for the hardcover edition of The Sunset Assumption. The most significant single event for me was 2010 New Year’s Eve – we went for drinks on the Ile de la Cite with Judit and her husband Cristophe, then we all went to midnight mass at St Gervais (it went for two hours; it was fabulous – but it was also freezing!) and then we drank champagne in our studio with them until 3.30 in the morning. One December morning, also, I woke to find it snowing heavily – I rushed up to the Place des Vosges, which was deserted. In the snow, it was breathtaking. I also found Parisians, by and large, to be helpful and friendly, if a little brusque and formal. It’s a cliché, I know, but if you try to communicate to them in French rather than expecting them to decipher your English, they were always so much warmer. I would be too. Do you think the residency has had a lasting impact on your work? In what way? Yes, I think it’s had a huge impact on my work. I think I’m now writing better than I ever have. As well as simply the visceral, vivid nature of the experience, I think that operating in a culture where you struggle with language is good your writing poetry – it forces you to think about the nature of language in quite a minute way. Words become particular things – wonderful, intricate things. I’m so grateful for the residency. It was one of the most richly fulfilling experiences of my life.